Levi Albright rebelled against his Quaker roots to fight for abolition in the Union army in the first year of the Civil War. Two years later, 19-year-old destitute orphan Josephine Winters, with her chopped hair, boy’s clothes, and new name, “Snipp,” enlists in the Union army out of desperation. don’t turn her in to the authorities. Was the Union that desperate for soldiers? Having said that, the story is well-written, and obviously well-researched. Levi’s struggle with them is realistic. Highly recommended. Born and raised in western Michigan, Sharlene MacLaren graduated from Spring Arbor University then traveled nationally with a contemporary Christian vocal ensemble. She married Cecil, with whom she’d grown up in Spring Arbor, and the couple had two daughters. Shar embarked on a teaching career that would span over 30 years. As she contemplated retirement, Shar sought God’s guidance, praying for a vocation that would provide the kind of fulfillment and joy she experienced as a teacher and mother. 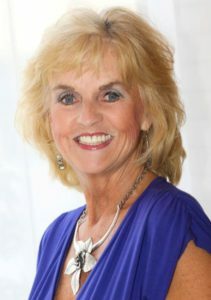 A lifelong gifted story teller, she began to write Christian romance novels. Her first book, Through Every Storm, published in 2007, was met with critical acclaim and brisk sales. The rest, as they say, is history. Whitaker House’s bestselling fiction author, she’s subsequently published 18 books, mostly historical romances. Shar enjoys reading, singing in her church choir and worship team, traveling, and spending time with her husband, children, and grandchildren. She’s very interactive on Facebook and Twitter. For more: www.sharlenemaclaren.com, www.facebook.com/sharmaclaren, Twitter @ sharzy_lu. 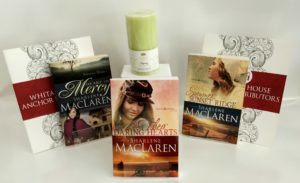 Grand Prize Package: Their Daring Hearts (Forever Freedom Series) #2 by Sharlene MacLaren; Summer on Sunset Ridge (Forever Freedom Series #1) signed by the author, Sharlene MacLaren, Abba Jerusalem Hyssop 6” Pillar Candle. 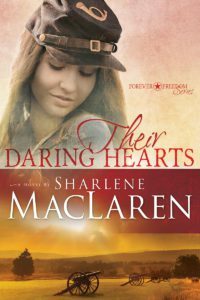 1st Place: Their Daring Hearts (Forever Freedom Series) #2 by Sharlene MacLaren; Heart of Mercy (Tennessee Dreams #1) by Sharlene MacLaren; Whitaker House/Anchor Coloring Book with Colored Pencils. 2nd Place: Their Daring Hearts (Forever Freedom Series) #2 by Sharlene MacLaren; Whitaker House/Anchor Coloring Book with Colored Pencils.!! I think many people confuse Quakers with Mennonites with Amish. It's great to find a book that will help readers understand what being Quaker means.